Peter is plotting his retaliation against the latest bombing. Neverland needs an army, and Peter Pan is certain children will join him once they know what is at stake. The lost boys and girls are planning an invasion in suburbia to recruit, but in order to deliver their message, they will need the help of an old and dangerous associate—the infamous Pied Piper. 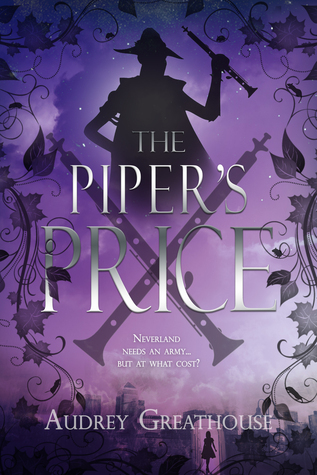 Hunting him down will require a spy in in the real world, and Gwen soon finds herself in charge of locating the Piper and cutting an uncertain deal with him. She isn’t sure if Peter trusts her that much, or if he’s just trying to keep her away from him in Neverland. Are they friends, or just allies? But Peter might not even matter now that she’s nearly home and meeting with Jay again. 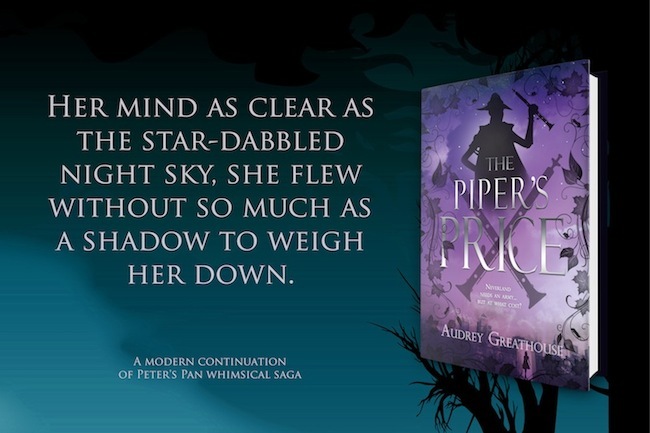 The Piper isn’t the only one hiding from the adults’ war on magic though, and when Gwen goes back to reality, she’ll have to confront one of Peter’s oldest friends… and one of his earliest enemies. They found the forest’s hiking trail moments before breaking the tree line. “Where are we going, Peter?” He was heading toward a mobile home community next to the state park. She didn’t want to appear conspicuous, but Gwen was too baffled to help it. The unkempt lawns were boxed in by chain-link fences covered in varying degrees of rust. They passed a lawn littered with bicycles; on the other side of the gravel street, two different cars were parked on the lawn, clearly non-functional. Satellite dishes were on every trailer home. Despite all being painted differently, the track housing still managed to present a uniformity of depressing color. Multiple houses had motorcycles out front or a dog milling around their yard. When she and Peter passed a pack of Rottweilers, the dogs ran up to the fence and began snarling until all the other dogs in the neighborhood were barking too. “Ignore it,” Peter advised her. She was scared. This was not the sort of place she ever expected to visit with Peter. She didn’t trust his ability to protect her here. This wasn’t his world, but it wasn’t hers either. They were both out of their element. Peter just didn’t have the sense to realize it. Winding down the gravel road, Gwen matched Peter’s pace almost step for step. They approached a blue-and-grey house. Like the others, it had wooden latticework around the bottom to help obscure the fact it didn’t have a foundation in the ground. The square house reminded Gwen of how she would take shoeboxes and try to turn them into homes for her dolls by decorating them. It was hard to fathom that she was walking up the plastic steps of the porch to knock on the door. She waited, feeling her heartbeat in her throat, her toes, and everywhere besides her chest. Even the predictable noise of the door opening startled her. A woman with a long, black braid and beige cardigan stood in the doorway. Gwen looked up at her, and then watched as the sharp features of her dark face dissolved into unadulterated shock. The startled woman ushered them in. She was just as uncomfortable with their presence in the trailer park as Gwen. Once inside, they stood in a living room full of old furniture, facing a kitchen with old electric appliances. There was no unity or romance to the orange recliner, chipped mixing bowl, off-white blender, dull toaster, and sunken couch. It was a bunch of old stuff that looked like it represented several decades of objects abandoned at Goodwill. The chingadera and bric-a-brac wasn’t any more cohesive: porcelain angles, an antique pot, a vase full of bird feathers, and a stopped clock made the place confusing and strange in the same way her grandmother’s house had been. “I need your help,” Peter said. “I took all the right precautions. This is important.” Hollyhock and Foxglove wrestled their way out of the pixie purse and came twinkling out now that they knew they were safely inside. “You brought fairies here?” she exclaimed. She leaned down and grabbed a hold of his arm, forcing him to look her dead in her dark eyes. Gwen wanted to leave. This wasn’t a friend, not anymore. This was a grown-up, and unlike Antoine the aviator, she was not amused with Peter’s wartime antics. “You’d take the blows as though you were made of rock, and you would not speak.” Peter seemed to disregard the question. “What if they tortured me and stuck blades under my nails?” she demanded. “Then you would not even scream, but stay silent as a stone!” Peter insisted, hopping up onto a wooden kitchen chair at her dining table, looking down at the woman. Her anger slunk off her face and out of her shoulders. She shook her head, frowning as a sad laugh escaped her. She clung to her sweater, blinking back tears, until, at last, she flung her arms around Peter. Still on the chair, he had to bend down to return the embrace. Audrey Greathouse is a lost child in a perpetual and footloose quest for her own post-adolescent Neverland. 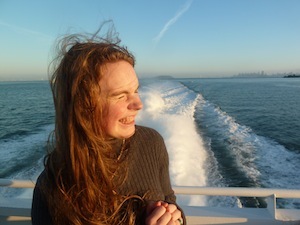 Originally from Seattle, she earned her English B.A. from Southern New Hampshire University's online program while backpacking around the west coast and pretending to be a student at Stanford. A pianist, circus artist, fire-eater, street mime, swing dancer, and novelist, Audrey wears many hats wherever she is. She has grand hopes for the future which include publishing more books and owning a crockpot. You can find her at audreygreathouse.com. I love the cover of this one so much.